Do you recognize this man? Chances are you probably do. 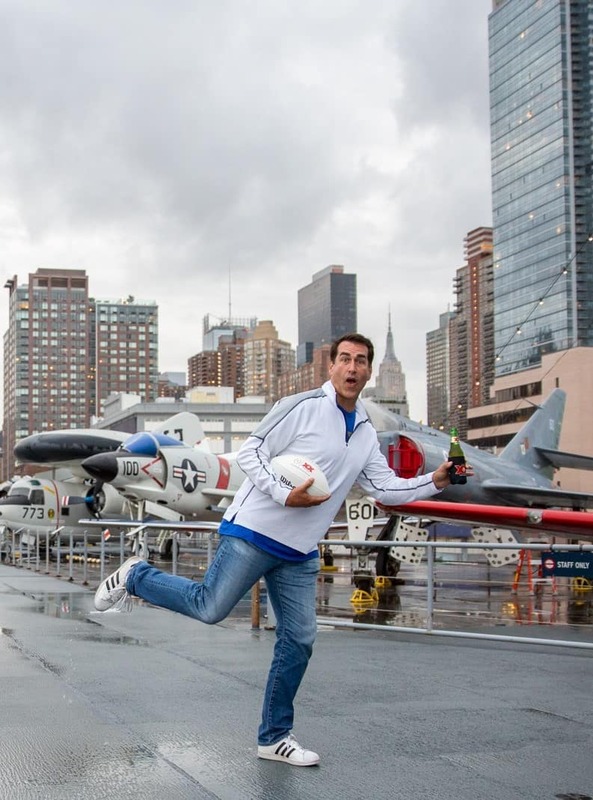 Riggle onboard the Intrepid with Dos Equis beer and football. Yes, he is the one and only Rob Riggle. You’ll recognize him from his roles in The Other Guys, Let’s Be Cops, 22 Jump Street, The Hangover, and Step Brothers. He was also a correspondent on Comedy Central’s The Daily Show, a cast member of Saturday Night Live, and a Modern Family regular. Riggle is also featured in two new Dos Equis commercials in their quest to reward the most interesting college football fans with the chance to be inducted into the College Football Hall of Fame this season. More on this after the interview. Today, we’re bringing you a one-on-one interview with the hilarious Actor and Comedian. Here’s what he had to say. MAN’edged Magazine: Thanks for sitting down with us. Your journey is one that our audience needs to hear because it’s one of hard work, dedication, and perseverance. MAN’edged: Frankly, we think you should be Dos Equis’ most interesting man in the world, but don’t tell them we said that. 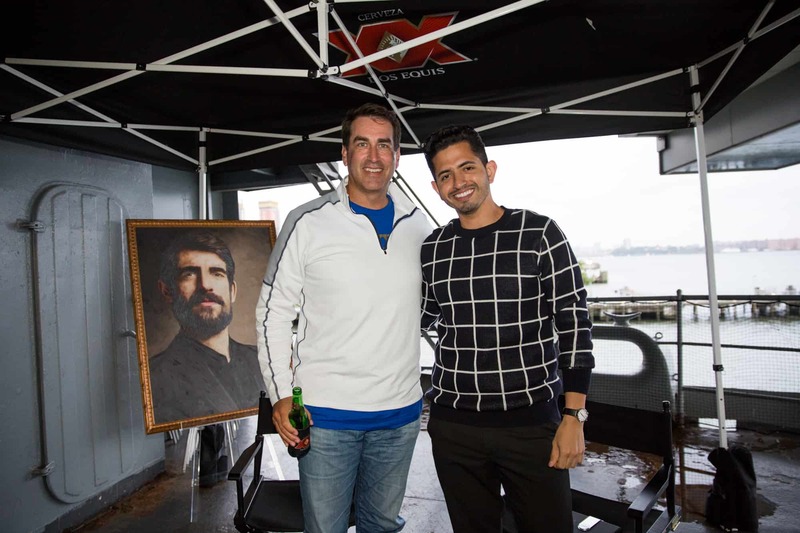 Actor and Comedian Rob Riggle with MAN’edged Media Founder Michael William G.
MAN’edged: Before we dive into why you’re working with Dos Equis, we want to help bring our readers up to speed on you. Is that alright? Rob Riggle: Sure, absolutely. Fire away! MAN’edged: Most would know you from having appeared in Dumb and Dumber, The Hanger Over, The Daily Show, and Saturday Night Live, but you’re also a retired U.S. Marine, correct? MAN’edged: Did you spent 23 years serving? Riggle: I did. I did 9 years on active duty and then 14 years in the reserves. People are always like (going into hilarious character voice), “How did you do acting and comedy while doing all these [other] things?”. Many don’t know this, but Riggle pursued acting and comedy while in the reserves. He mentioned that he would go do his usual drills and then craft his talent during his downtime. Riggle: When I was on the Daily Show, I would have to fly back to Los Angeles to go to Command Staff College (professional military education for field grade officers). I was a major at the time. I would spend my weekend, go back to Miramar, and stay at the BOQ (Bachelor Officer Quarter). I would go to class all-day Saturday and Sunday. Then, I would fly home Sunday night and land at JFK at about six A.M. on Monday. [I’d] take a cab straight from the airport to The Daily Show and work all-day Monday. Monday night was when I would usually crash. I did that for about two years. 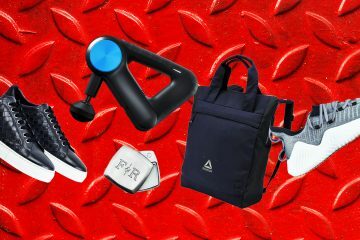 MAN’edged: According to FastCompany.com, in 1995 you had a friend who studied Improv? Riggle: Yeah, in Chicago. Kevin! MAN’edged: He called you and said, “Riggle, you gotta do this.” Can you share a little about that moment? Riggle: That’s absolutely right. His name is Kevin Custer. He’s a wonderful man. I think very highly of him because he’s dedicated his life to charity. In college, we would always do bits together and crack each other up. We’d film things but didn’t know what we were doing. It turns out, it was called improv. We didn’t know it had a name. MAN’edged: So, his call played a pivotal role in your career?